In large part to the efforts of healthcare providers and community members, the number of sleep-related deaths in Baltimore City has decreased significantly. Unfortunately in 2018, 13 babies died of sleep related causes. All of the babies were in unsafe sleep environments and it is likely that their deaths were preventable. 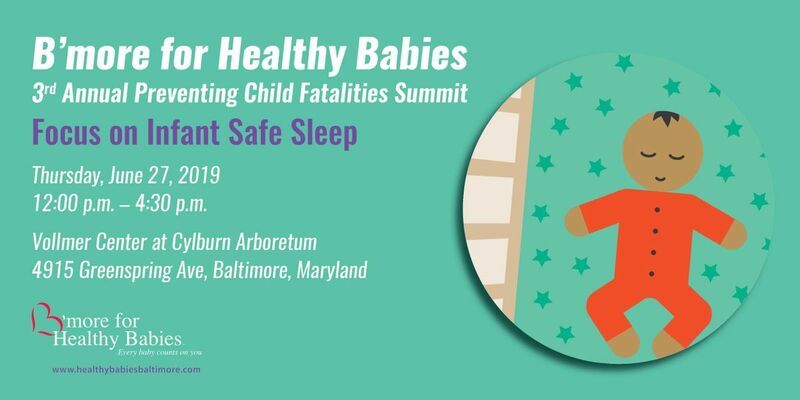 B’more for Healthy Babies is hosting its third Preventing Child Fatality Summit— An educational event for healthcare providers focused on addressing sleep related infant deaths in Baltimore City. Hear from renowned experts about recent research and recommendations. Learn how hospitals are implementing best practices and create a plan of action that will keep all of Baltimore's babies safe during sleep. Dr. Rachel Moon, MD, FAAP an internationally recognized expert in sudden infant death syndrome and co-author of the American Academy of Pediatrics Safe Sleep recommendations will be one of our distinguished speakers, with many more to be announced. This educational event is ideal for pediatricians, obstertricians, family practitioners, nurse practitioners, nurses, public health leaders and other professionals working with women and children.